As with many American Indian arts, there were originally many different native sculpture traditions in North America. In the Southwest, Indian sculptors carved small stone figurines in animal, human, and supernatural shapes, usually known as "storytellers" or "fetishes." Some, like Zuni fetishes, were totemic and featured inlaid eyes and heart lines; others, like Navajo storytellers, were strung together into 'fetish necklaces' that served as mnemonics for traditional stories. Pueblo artists carved figurines from clay and fired them in their pottery kilns, and the Hopi carved elaborate kachina dolls from whole cottonwood roots. In the Northwest, Indian woodcarvers are best known for their impressive totem poles and intricate bentwood boxes. The Ojibway and other northern Plains Indians carved pipes and ceremonial objects out of catlinite clay (known as pipestone). The Iroquois tribes and their distant relatives the Cherokee were known for their elaborate wooden masks, and the Algonquian peoples of the east carved staffs and bowls primarily out of tree roots. Further to the north, the Inuit ("Eskimos") carved ceremonial dance masks from wood and figurines from ivory and soapstone. Of course, since there were lively trade routes throughout native North America, even in ancient times different American Indian sculpture styles spread beyond a single tribe or culture group, and after colonization, displacement from their native lands made it hard for Indian sculptors to find their traditional materials, so fusion styles of sculpture arose. Today many contemporary Indian sculptors also use Western materials and techniques to depict native people, experiences, and themes. If you are looking to buy sculpture, figurines, or carvings that were actually made by Native Americans--either because it's important to you to have the real thing or because you want to support native people with your purchase--then here is our list of American Indian sculptors whose carvings are available online. If you have a website of Indian sculpture to add to this list, let us know. We gladly advertise any individual native artist or native-owned art store here free of charge, provided that all carvings were made by tribally recognized American Indian, Inuit, or First Nations artists. On our main site we do our best to avoid slowing down our page loading with graphics, but this page is about art, so we'd really be remiss in not showing a few representative sculpture pictures. All photos are the property of their respective artists; please visit their sites to see their work in more depth. This Pueblo pottery gallery crafts ceramic figurines including storytellers, painted animal fetishes, and Southwest Indian nativity sets. A large and varied collection of traditional American Indian woodcarvings from Northwest Coast and other First Nations artists. 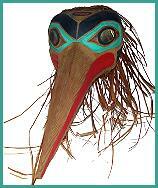 Masks, bentwood boxes, staves, wooden figurines, wall hangings, and more. Contemporary wood sculptures and carved walking sticks by a Colville Indian artist. Carved from wood, gourds, leather and ivory, masks are a longstanding part of American Indian regalia which are still used for dances, storytelling, and as decorative art today. View some at our Native American Mask gallery. Not many people are truly in the market for buying a 30-foot-tall, $75,000 work of art, but Northwest Coast and Athabaskan Indian artists are still making these impressive sculptures in the traditional way today, and some of them carve smaller totem poles for sale (the one at left is about four feet high). Visit our Totem Pole gallery to see some more totems from today's carvers. Kachina carving is a uniquely Hopi art. Though commonly called "dolls" they are in fact stylized religious icons, meticulously hand-carved from whole cottonwood roots by a small number of Hopi artists who have won the cultural honor of making them. Visit our Kachina gallery to see examples of this beautiful art form. Ojibway-owned crafts store offers soapstone carvings in contemporary Indian styles. Overview of Zuni fetish carvings, their forms and meaning. Color photographs and interviews with Zuni carvers. Photographs and history of Inuit carving arts. Art book featuring Chiricahua Apache artist Allan Houser's compelling sculptures. A good book on American Indian art history in general, from ancient times to today. About us: This website belongs to Native Languages of the Americas, a non-profit organization dedicated to preserving and promoting endangered Native American languages. We are not artists ourselves, so if you are interested in buying some of the carvings featured on this page, please contact the artists directly. Though we have featured only Native American sculptures identified with the name and tribal affiliation of each artist, we haven't called the tribal offices to check up on any of them, and we only know a few of them personally. We also don't guarantee any of their products. This is not an exhaustive list of Native American sculpture--if you would like us to add your carving site to this page, please contact us with your URL and tribal affiliation. We advertise any individual native artist or native-owned art business here free of charge. We do not link to masks which are not made by tribally recognized American Indian, Inuit, or First Nations artists, so please do not ask us to. And finally, websites do occasionally expire and change hands, so use your common sense and this general rule of thumb: if the creator of each individual artwork is not identified by name and specific tribe, you are probably not looking at genuine Native American sculpture.